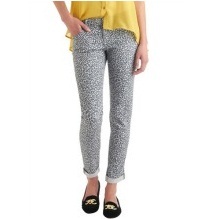 Hang out in the clubs with your best friends in these charcoal and light grey cheetah-print pants! The tiny cuffs at the bottom, skinny-jean fit, and four-pocketed design goes well with a snowy, sheer shirt, bright blue flats, and a 3/4-length sleeve leather jacket. Wear these purrrr-fect pants and pounce into a pleasant evening of girlish fun! – 99% Cotton, 1% Spandex. – Machine wash cold separately inside-out. Do not bleach. Tumble dry low. Remove promptly. Warm iron if needed. – Unlined. Three open pockets at front. Two open pockets at back. Hidden front zipper with button closure.